Nacházíte se: Booktook.cz → Odborná literatura → Cizojazyčné → Ostatní obory a další literatura → Slatter's Fundamentals of Veterinary Ophthalmology 5th Ed. Slatter's Fundamentals of Veterinary Ophthalmology 5th Ed. 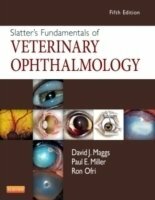 Recognize, diagnose, and manage a wide range of common ocular conditions with "Slatter's Fundamentals of Veterinary Ophthalmology, 5th Edition". Covering small and large animals including birds and exotic species, this reference provides the latest, most practical information on structure and function of the eye, ocular development, pathology, examination and diagnosis, surgical procedures, ophthalmic pharmacology and therapeutics, and management of ocular emergencies. Nearly 1,000 color photos and illustrations accurately depict ocular conditions and demonstrate surgical techniques. Edited by noted veterinary ophthalmologists David J. Maggs, Paul E. Miller, and Ron Ofri, this reference is an essential aid to clinical decision-making, from differential diagnosis to medical and surgical management.